Strips of Triangles give an interesting variation to the traditional Flying Geese. 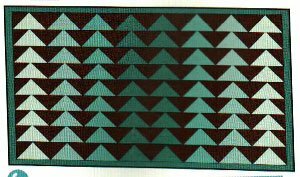 Try these strips in your quilted clothing or as borders in your next quilt. Uses Kaye's Starmaker 8 Master Template. Pattern is in the Ebook, Strip Cut Quilts available by clicking the links.